Poncho kisses the man who helped heal him. *Just in case you think you might be seeing things as you look at the photo above. You kind of are. 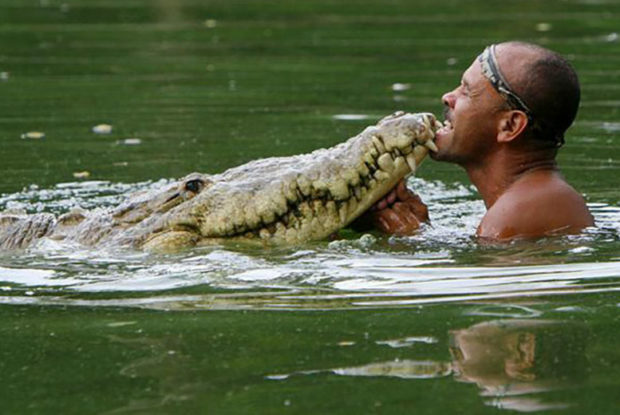 You are seeing a crocodile named ‘Poncho’ kissing a man named Chito Shedden, a fisherman who saw him injured and alone, and rounded up a group of brave friends to lift the croc and take him to safety. The reptile reportedly lay dying on a river bank in Siquirres, Costa Rica when the fisherman spotted him. Snedden, a tour guide by trade, kind of fancies himself as an amateur naturalist and as such has learned a few things. Obviously, how to wrangle in a crocodile without being eaten alive is one!